It’s a magical time of year in Colorado’s high country: Cool, crisp air gives an invigorating kick to the day, bluebird skies prevail, and whole hillsides transform to bright, cheery hues. The aspen leaves are starting to hint at the full show to come. Soon Colorado’s hills will be blazing with fall color, the best kind of mountain fire. Now is prime time to get out and experience the great outdoors for one last hurrah before winter. 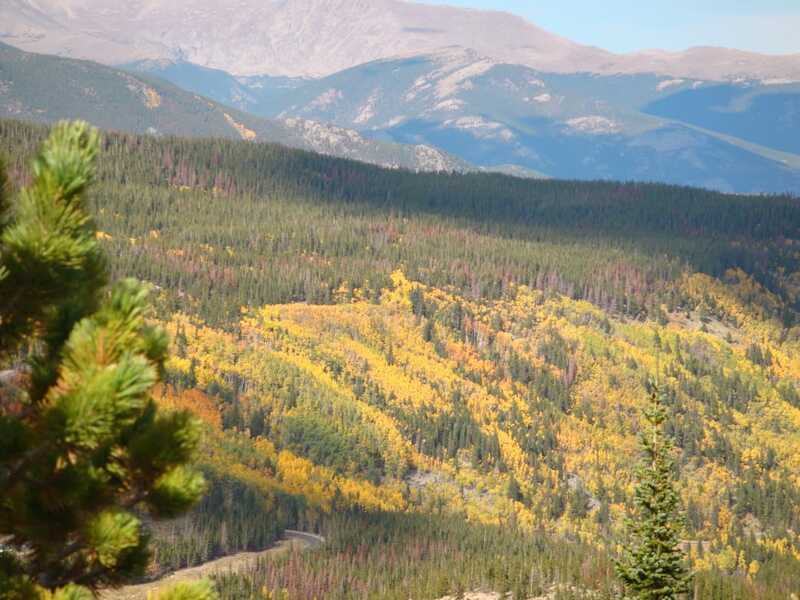 Here are some great leaf-peeping options within an easy drive of Denver or Boulder. Decide whether you want to hike, run, bike, or simply drive, but be sure to get out and savor the spectacular fall foliage in Colorado. The Colorado Trail from the top of Kenosha Pass is a prime place to roll through aspen glades on two wheels. Kenosha Pass delivers the mother lode of aspen gold. From the top of the pass, the Colorado Trail winds through amazing glades, crosses an aspen-covered hillside, then climbs to the summit of Georgia Pass, a 24-mile, out-and-back ride that will leave you smiling from ear to ear. Where the trail descends the backside of Kenosha Pass, the autumn sun’s low-angle light pierces the trees’ leaves, lighting them on fire. You might feel compelled to stop and take in the view. To get to the trailhead, take Highway 285 south to the top of Kenosha Pass. The parking area is on the right at the top of the pass. You’ll start at just a hair over 10,000 feet, then pedal a series of climbs and descents before the final grunt to 11,585 feet atop Georgia Pass. The trail includes smooth singletrack, doubletrack, and some rocky and root-riddled sections. Bring big lungs. 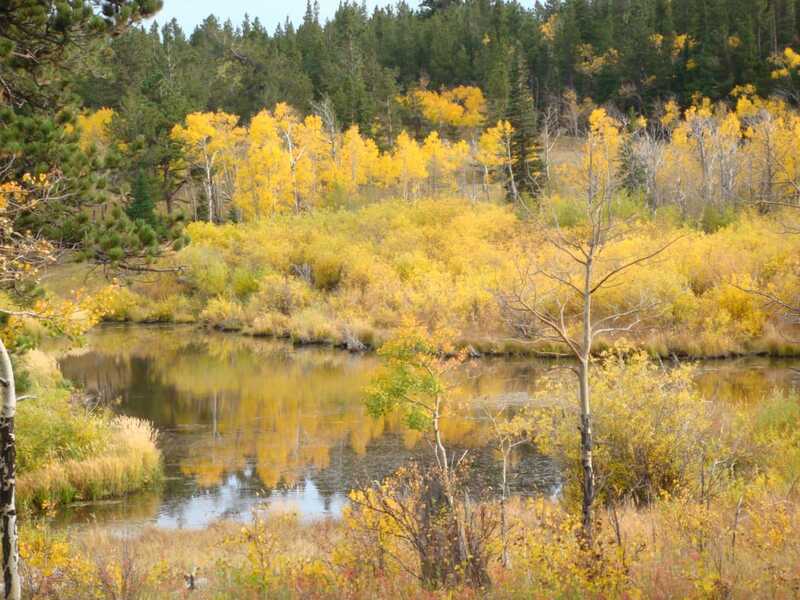 Aspens and willows erupt with fall color along the wetlands at Caribou Ranch. Combining the DeLonde Trail and Bluebird Loop at Caribou Ranch creates a lollypop route that is a trail runner’s delight—4.2 miles round trip at an easy grade that climbs less than 300 feet. Best of all, it rolls through prime aspen elevation, so you’ll be going gaga over color the whole way. The leafy palette can span the gamut from yellow to orange and red, while colorful grasses and willows further enhance the stunning scene. Stop for a rest at the historic DeLonde Homestead cabin. This Boulder County Parks and Open Space property is just north of Nederland. From the traffic circle in Ned, drive north on Highway 72 for two miles, then turn left on County Road 126 and follow signs to the Caribou Ranch trailhead. Dogs aren’t allowed, so leave your pooch at home. Hiking up from the Glacier Gorge Trailhead in Rocky Mountain National Park rewards with this stunning vista. The climb from Glacier Gorge Trailhead in Rocky Mountain National Park passes through electric aspen stands along the trail to Alberta Falls. After a steady climb, the view opens to reveal a vast aspen-covered hillside across the valley on the other side of Bear Lake Road. Hit it right and you’ll delight in a kaleidoscope of color. The trail eventually emerges from the aspens and offers options for continuing to one of several alpine lakes. To get to the Glacier Gorge Trailhead, follow U.S. 36 through Estes Park to the Beaver Meadows Entrance to Rocky Mountain National Park. Take a left on Bear Lake Road and follow this to the trailhead. Parking fills up early, so consider taking the free shuttle from the park-and-ride across from Glacier Basin Campground. The Peak to Peak Highway north of Nederland is well known for colorful views. For a delightful Sunday drive, or to string together Caribou Ranch and Rocky Mountain National Park in one epic day, cruise the Peak to Peak Highway from Nederland to Estes Park. Colorado seems like a bit of a show-off along this 42-mile stretch of scenic byway, which offers hit after hit of fabulous fall foliage. The riot of color draws out leaf-peepers in force, so don’t expect to get anywhere in a hurry. Stop for photos and savor slowing down instead. 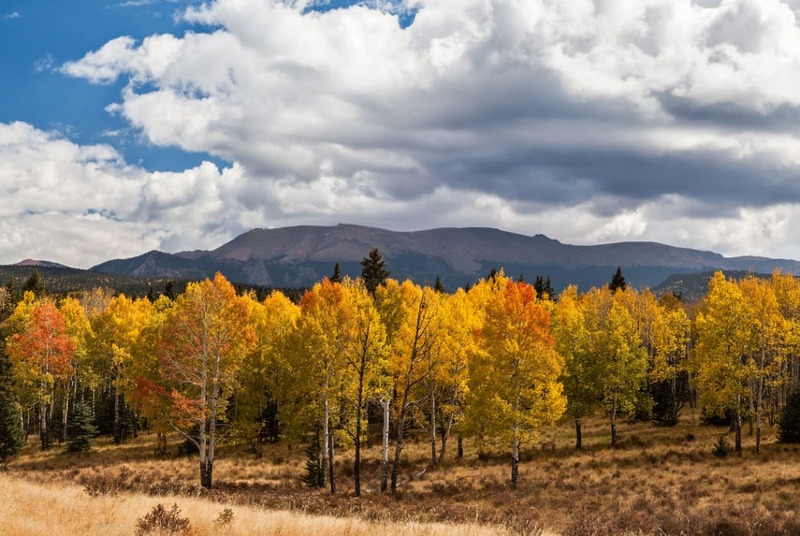 Mueller State Park’s colorful aspens are juxtaposed against high-mountain views. 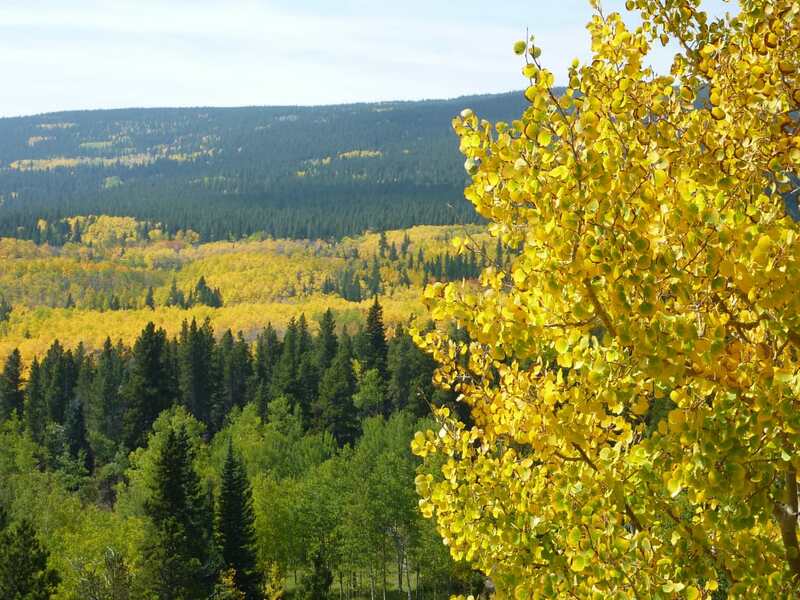 To bask in fall glory without battling I-70, check out Mueller State Park outside of Colorado Springs. 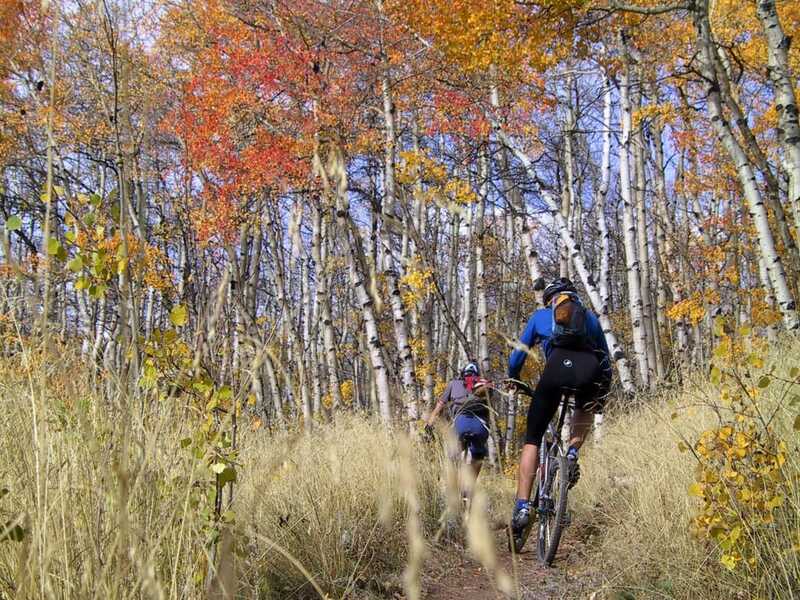 The park boasts an almost indulgent cache of aspens, as well as 55 miles of trails (19 miles are open to bikes). The trail system spreads out over the park like strands of spaghetti, allowing you to string together a route perfectly tailored to you. For triple-header pleasure, start from the Outlook Ridge Trailhead and hike along the Outlook Trail to three separate spurs—Raven Ridge Overlook, Red Tail Overlook, and Lone Eagle Overlook—which make up a nearly 4-mile route with awesome views. Or check out the vast aspen stands in the northern part of the park. To get to Mueller State Park, take U.S. Highway 24 west from Colorado Springs to Divide. Turn left (south) on Colorado Highway 67 and drive about four miles to the park’s entrance. There’s a $7 daily entrance fee per vehicle.